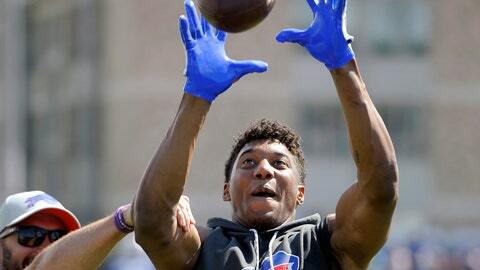 PITTSFORD, N.Y. (AP) — The scars still visible on Zay Jones‘ right knee are a reminder of what could have happened in March, when the Buffalo Bills receiver was caught on tape, bloodied and naked, while arguing with his brother in a downtown Los Angeles apartment hallway. Though the second-year player declined to explain what happened, Jones said he’s now focused solely on securing his spot on the roster, rather than reflect back after practicing for the first time this year. Jones was activated off Buffalo’s non-football injury list 10 days into training camp and practiced on a limited basis. The former second-round draft pick missed the team’s spring practices after coach Sean McDermott in mid-May announced Jones had knee surgery. McDermott wouldn’t reveal how or when Jones was hurt. Jones wouldn’t shed much light on how the injury occurred. The 23-year-old Jones said he’s at peace, and grateful for the support from his coaches and teammates. He was arrested after officers were called to a disturbance, where Jones was found “breaking glass doors and windows.” Prosecutors declined to file felony vandalism charges against him because of insufficient evidence. Jones is coming off a disappointing rookie season in which he failed to play to the expectations he established at East Carolina, where Jones set an NCAA FBS record with 399 career catches at East Carolina. He finished fifth on the Bills with 316 yards receiving and scored twice in 15 games. Jones’ return overshadowed Bills starting receiver Kelvin Benjamin landing in hot water for questioning why the Carolina Panthers drafted him, and criticizing former teammate Cam Newton’s accuracy in an interview published in The Athletic on Friday. Benjamin said he understood his coach’s concerns. In saying he doesn’t want to be a distraction to the team, Benjamin didn’t distance himself from what was published. Without mentioning Newton specifically, Benjamin said he could have been more productive with “any other quarterback.” He then pinpointed several star quarterbacks, including Green Bay’s Aaron Rodgers, in saying they had the knowledge and accuracy of placing a pass to a spot that makes it easier for a receiver to catch the ball. Newton was not available for interviews following practice in South Carolina. Carolina coach Ron Rivera declined to discuss Benjamin’s comments because he’s a member of another team. Panthers tight end Greg Olsen said he partially understood why Benjamin might be frustrated because things didn’t work out for him in Carolina. “Things didn’t work out for him here, I get it,” Olsen said. Benjamin’s past with the Panthers has been a touchy subject. In June, Benjamin told The Associated Press he was the one who asked the Panthers to trade him in a deal that eventually landed him in Buffalo in October. He set team records for rookies with 73 catches, 1,008 yards receiving and nine touchdowns. He missed the entire 2015 season with a left knee injury, and totaled 95 catches for 1,416 yards and nine touchdowns in his next 24 games before being traded . Beane was the Panthers’ assistant general manager, and had a hand in drafting Benjamin.